Remember my quick and easy mantra? Making bread dough from scratch and all that fermenting require planning. Easy enough but definitely falling short on the quick requirement. Fortunately, ready-made pizza dough is widely available in most supermarket and it is the shortcut to (sort of) homemade bread bliss. 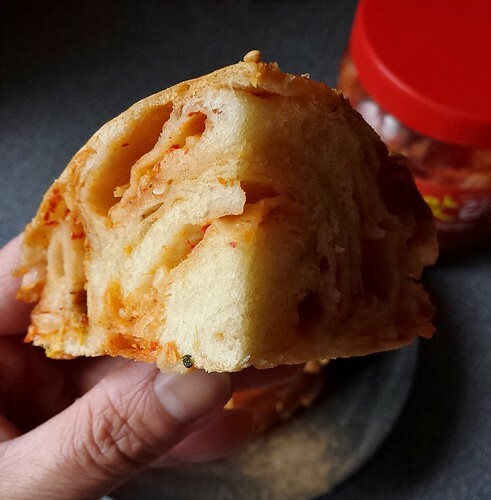 I layered and swirled chopped kimchi, toasted sesame oil, and toasted sesame seeds into squishy soft pizza dough. With a slick of egg wash, the buns baked into mahogany outside with tender crumb and jolts of spicy kimchi in every bite. It was ridiculously addictive! 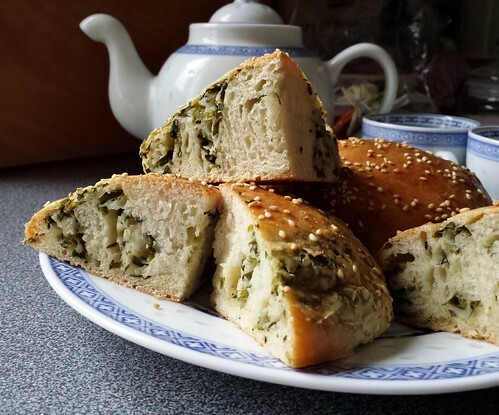 Using the same technique, I also made Sesame Chives Buns and can imagine lots of sweet or savoury possibilities. How about blueberry cream cheese breakfast buns? Or even taking advantage of the soft pizza dough and fashion into a pan of cinnamon rolls with cream cheese frosting? Stretch or roll a 150g dough piece roughly into a rectangle as thin as you possibly can. Smear or brush with thin layer of sesame oil, about 2 teaspoons. Sprinkle with sesame seeds. 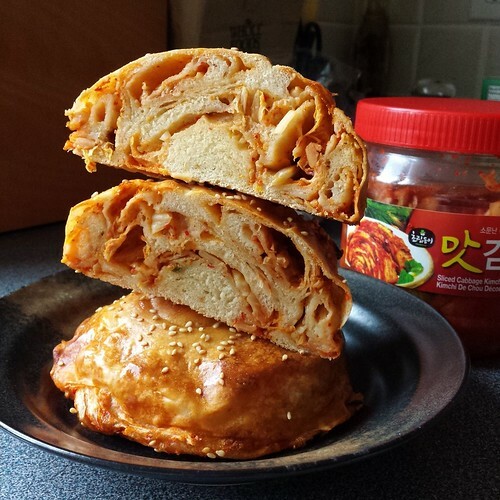 Scatter 1/2 cup of chopped kimchi evenly on dough leaving 1 cm border. Roll into a tight jelly roll from the long side. Pinch to seal the edges. Roll the rope into a snail. Flatten the snail with palm of your hands. Repeat for remaining 3 balls of dough. Flatten the shaped buns once more on prepared baking sheet. Brush with whisked egg. Sprinkle with more sesame seeds. Bake for 30-35 minutes until golden. Eat while still warm. 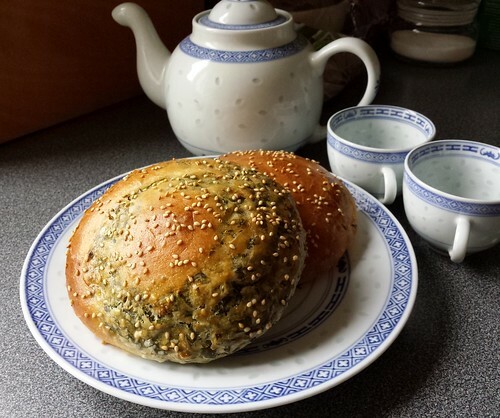 Sesame & Chive Buns: replace kimchi with chopped Chinese chives. Season with salt in step 3.